Beef tenderloin cooked “à point” or medium rare is my favorite dish. Because the steak is cooked rare, it is necessary that the meat comes from a healthy and sanitary source. It should be purchased in a supermarket that is noted for high quality meat or from a butcher you trust. To enjoy beef tenderloin in all his goodness, it is necessary that the portion weight be at least ½ pound. A lower weight does not preserve the tenderness of the meat during cooking. Beef tenderloin is reserved for special occasions and prepared at home, served on a well laid-out table, with a good red wine, can put everyone in a good mood. The recipe that I propose is fast and very tasty. If you like meat well-done, I recommend you use other cuts of meat, because if you overcook the meat, you will basically throw your money away. 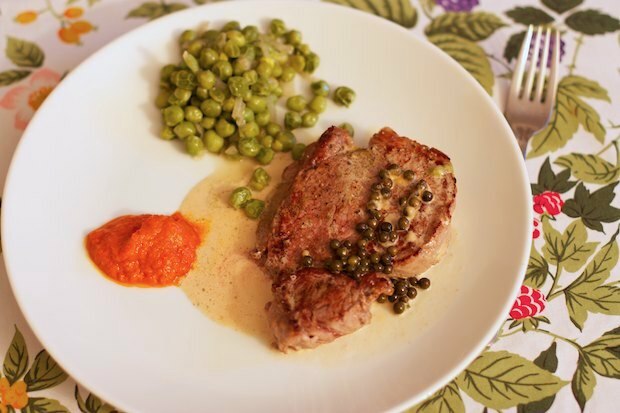 This dish can be served with buttered peas with parsley and red pepper sauce. Prepare all the ingredients on hand in the directed quantities. Pour the heavy cream and green peppercorns in a bowl. Warm up the cognac in a small saucepan without bringing it to a boil. Add the butter to a pan that can hold 4 steaks and melt it over high heat. When it is nice and hot, add the steaks and cook for 5 minutes on one side, then 2 minutes into cooking the other side, add the heated cognac which will then ignite and cook off the alcohol. As soon as the flame goes out, add the green peppercorns and the cream, taking care to pour it slowly into the pan. Add a bit of salt to finish. Bring to the table and add a little bit of cooking liquid and green peppercorns over each steak. Posted in Meat and tagged with Beef Tenderloin with Green Peppercorns, Filetto di Manzo al Pepe Verde. RSS 2.0 feed.